Samsung this week unveiled a new rugged smartphone: the Galaxy Active Neo. Officially announced in Japan, the Active Neo can be seen as an upgraded Galaxy Xcover 3, or a seriously downgraded Galaxy S6 Active. The new handset sports a 4.5-inch display with 480 x 800 pixels, so it's definitely not targeted at users in need of large, high-res screens. On the plus side, the Galaxy Active Neo runs Android Lollipop, it's dust- and water-resistant (IP67-certified), and can be dropped onto concrete from 1.5 meters without being damaged. 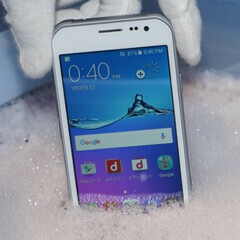 Powered by a quad-core Qualcomm Snapdragon 410 processor, the Samsung Galaxy Active Neo further features LTE connectivity, an 8 MP rear camera, 2 MP front-facing camera, 2 GB of RAM, 16 GB of expandable storage space, and a 2200 mAh battery. Customers buying the Active Neo will also get 100 GB of free OneDrive storage space for 2 years. The new Samsung Galaxy will be available in Japan starting early November, via NTT DoCoMo, for around $168 (off contract). Samsung didn't say if it's planning to release the Active Neo in other markets. Would you consider buying one? Why would you want a Note Active? The Note needs to be as slender as possible. We dont need an active version. Get an S active and buy a Pen. Spen works on the Note because of the active digitizer. Also some people prefer an all day battery life instead of gimmicky slim body with stupid glass covering the back. Huh? It's impossible due to lack of digitizer. Only "solution" with Active is to use s****y capacitive stylus. That's one ugly phone. Who would buy that? 2gb ram? Wish they put it in galaxy j2 and galaxy core prime it could make good low end smartphone. Good for $168. The only thing that disappoints at its price is the display. A cheaper s6 active yet it claims to be stronger? IPhone 6s specs with durabilty thrown in for $170? Good value.